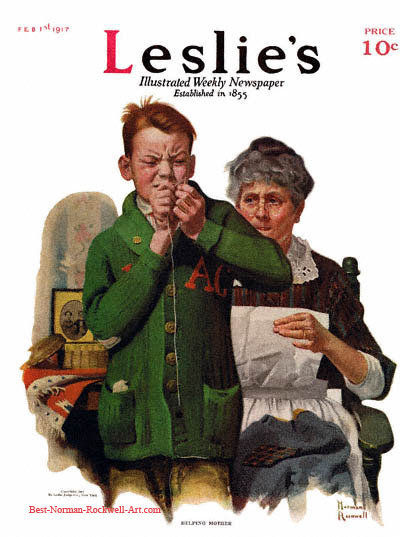 Helping Mother, this Norman Rockwell painting, appeared on the cover of Leslie's published February 1, 1917. An alternate title for this illustration is Boy Threading Needle. This was the third cover by Rockwell to appear on Leslie's and the second of three in 1917. Only six Rockwell covers were published by Leslie's from 1916 to 1919. Rockwell only submitted to this smaller magazine after the bigger publishers had declined to publish the cover illustration. This boy is helping his mother by threading a needle for her. His younger eyes can no doubt see the needle hole better than her older eyes. He has already wet the thread with his saliva. He is concentrating and holding the needle and thread just right. Why won't the darn thing go in? Did his mother request help with her needle or did he volunteer? The expression on Mother's face is one of helpfulness. She is looking over her spectacles at the struggle. Her tongue is on her lips. I suppose that she is threading the needle in her mind. She could probably accomplish the task without a conscious thought about it. Her patience will reward her when the boy starts making repairs to his own clothing. Let's hope she is patient for that, too .